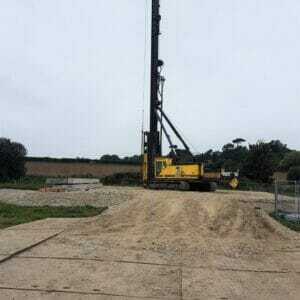 Piling & Mini Piling for Richborough Connections: Driving precast piles, micro piles and bottom driven piles for new overhead high-voltage transmission line. In 2017, Aarsleff Ground Engineering were awarded the contract to provide piling for a new scheme set up by one of the largest electricity and gas transmitters in the UK, the National Grid.The Richborough Connection scheme is part of a new 20km high-voltage overhead transmission line from Richborough to Canterbury. The line will connect up to new power sources, including a new subsea power supply from Belgium to the coast of England. For the project, Aarsleff drove 950No. 400mm square precast concrete piles utilising four of its Junttan and Banut rigs, driving piles from 6m to 30m in length. The challenge of the project was due to the 60 pylon sites across 20km of Richborough countryside. Along with the precast piles, Aarsleff installed 563no. micro piles, which ranged from 10 metres to 25 metres, and 96no. bottom driven piles. These piles were utilised at some of the pylon sites due to restricted access and low overhead cables.